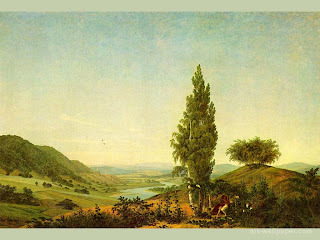 "The Summer" by Friedrich is a beautiful example of a Romantic painting. It has a very calming, serene feeling and also realized the green tone of the whole painting accents the calmness. The trees and other objects up close are bold and bright and stand out the most, whereas, in many paintings, the images in the background fade out into the horizon. I love the lighting because it seems to bring the whole painting to life. If I keepmy eyes unfocused I believe this painting would look like a photograph. There is not much detail in the background, but the fact that things fade give a viewer a sense of how far back things go and how much space there is. On the contrary, there is an abundance of detail up front and I even see a couple figures of people I cannot quite make out. They blend in too much with their surroundings to actually been seen immediately. I think this painting by Friedrich shows the beauty of nature because there is not much movement and nothing has been destroyed. There is a stream flowing, and green grass, and nice trees, all of which are features of a beautiful environment.